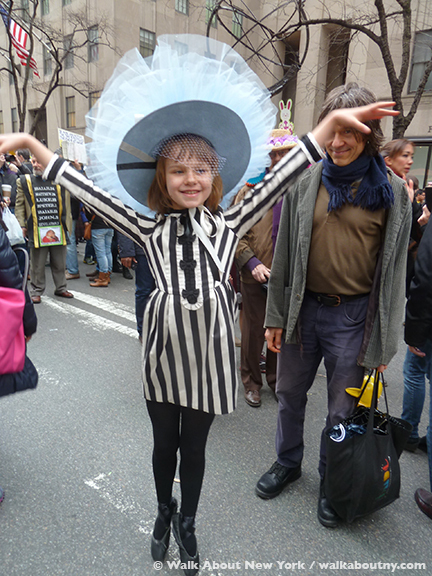 New York’s Easter Parade 2015. Proud as a Peacock: my favorite photo of Easter Parade 2015. What with the ubiquitous mobile phone camera, everyone today is a photographer. When one of them snaps you, the rotogravure is not where you will be seen. More likely you will be appear on someone’s Facebook page or in a blog post, including Walk About New York’s. Nothing could say spring in New York better than attending the Easter Parade as Miss Liberty carrying a bunny torch. In 1933 Irving Berlin wrote “Easter Parade,” for a Broadway revue titled As Thousands Cheer; Mr. Berlin used music he had written in 1917, adding new lyrics. The 1948 film Easter Parade, a vehicle for Judy Garland and Fred Astaire, took its title from the song. These charming women stood out wearing their colorful outfits. New York’s Easter Parade steps off at 10 o’clock on Easter Sunday. Fifth Avenue is blocked off between 49th and 57th Streets. No longer a display of new Easter finery, as it had been from the 1870s through the 1950s, the 21st-century Easter Parade has become an opportunity get creative and have some fun! Enjoy your Walk About New York’s recap of the 2015 Easter Parade. The woman smiling proudly designed and created both hats. Brava! It was not a winning season for the New York Jets football team; but this fan wore a winning costume and hat! Yellow foam was used to create big hair; but tiny hats topped the bouffant hair-do. The one on the right just had to take that call! Framed: Henri Mat’Easter smiles with a reproduction of Matisse’s “La Danse” balanced on his head. Could these two be fans of Jay-Z, the rapper/music impresario ? This darling young girl danced, en pointe, from Swan Lake as her proud papa looked on. She was quite the little performer. The Easter Parade has gone to the dogs. For small dogs attending the Parade, a stroller was the best way to get around without getting stepped upon. After attending the Easter Parade for five years, it has been noticed that the number of dogs has increased in that short amount of time. It is the smaller ones that get decked out they their owners. Jesus Christ out and about on his most important day makes friends amongst the crowd. He was carrying a basket of lollipops. A rabbit ear-hatted family was game for photo taking; everyone is quite cooperative when asked for photos. Nothing could say spring more than a man wearing a boater hat, a seersucker jacket and a bow tie decorated with jelly beans, and carrying a walking stick with a bunny head. Chicks, bunnies, and ducks are all symbols of spring’s renewal. A huge dahlia and butterflies were enough to create an eye-catching hat, made by the wearer. They are all ears outside of St. Patrick’s Cathedral, where everyone eventually passes in their finery. The Empress and Emperor of the “Night of a Thousand Gowns,” a charity event benefiting The Gay and Lesbian Center and The National Gay and Lesbian Task Force on April 11, 2015. The women on the left and in the center attended church on Easter Sunday; the one on the right was busy fixing her hat instead. That is what they told me. 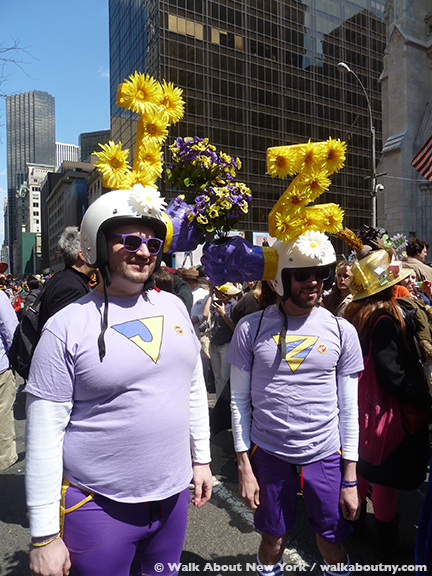 These two men sport a simple, stylish look at the Easter Parade. With their hats spelling out “Happy Easter Sunday,” this mother and her sons helped us remember the day and holiday. Real flowers decorate the heads and hats of these two men. Simple red paper was used by this mom to create her Easter bonnet and those of her daughters. The dapper period clothes of this couple recalls the time when the Easter Parade was a time to dress up. Well done! Nothing short of monumental silk flower arrangements would do for the hats of this foursome. Flower pot hats topped the heads of this smiling trio. This color coordinated couple told me the woman’s mother is her stylist, finding gems at thrift stores and yard sales. She then passes them along to her daughter. With his top hat and cape this well-turned out gentleman reminded me of the Gay Street Phantom, who is said to haunt #14 Gay Street. Discover the location on our Gay Village Walking Tour. Bringing the look of another land to the Easter Parade, this colorful character poses with an admirer. For a look back at the 2014 Easter Parade click here.